Bald patches, hair loss, and spot baldness are all descriptive symptoms of a common skin disorder known as alopecia areata. Often, people assume hair loss is a symptom of another serious health condition, but when someone is diagnosed with alopecia, they are likely a healthy individual otherwise. Unfortunately, this abnormal skin condition is hereditary and can occur at any age. At Kallgren Dermatology, our dermatologists can diagnose and treat this frustrating medical condition for sufferers in the Boulder area. If you are experiencing pattern baldness but unsure of the cause, we can help. This blog will discuss the cause of alopecia, symptoms to look out for, and how to treat and live with the condition. Alopecia is a disease that attacks the body’s hair follicles, causing the hair to fall out in round patches. Alopecia is considered to be an autoimmune disease that mistakenly fights off hair follicles instead of protecting the body from foreign viruses and bacteria. Immune system cells (white blood cells) grow at a rapid pace inside of the hair follicles, causing the follicles to decrease in size which drastically slows down the hair production. Most people with the condition experience patches of hair loss from their scalp, while very few people lose their hair entirely from their scalp, known as alopecia areata totalis. Even more uncommon is alopecia areata universalis, which is complete hair loss throughout the body, face, and scalp. Two key roles that doctors believe is the cause of alopecia areata are genetics and environmental. Each person is different, and doctors have yet to confirm what the exact cause is. Research has shown that children are more prone to developing alopecia, especially if a close family member also has the condition and began losing hair before the age of 30. The sole symptom of alopecia is the loss of hair. It is entirely painless, and will not make you sick in any other way. Alopecia is not a result of another health concern, in fact, most people who have alopecia are relatively healthy. While hair loss is the primary symptom, some people may experience more hair loss than others. 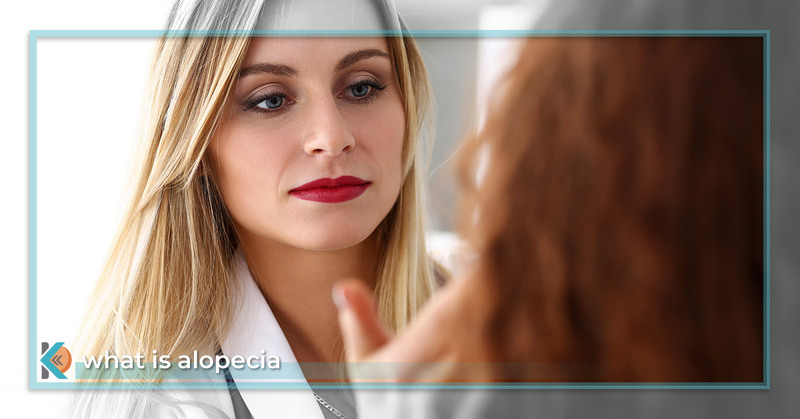 Dermatologists and doctors are both qualified to diagnose alopecia. Most of the time, they’re able to diagnose by merely evaluating the area of hair loss and examining hair samples under a microscope to get a closer look at the condition of the hair. A skin biopsy can also be performed to confirm the diagnosis and rule out fungal infections that cause hair loss to ensure that the patient is adequately treated. Doctors will investigate the last several months leading to hair loss and question drug intake, weight loss, and other illnesses. Family history is crucial, as mentioned prior, alopecia has shown to have genetic characteristics. Laboratory tests are performed to evaluate iron and vitamin D levels and can be used to determine if thyroid functionality is normal. When hair samples are taken, doctors may collect the hairs based on a pull test. A pull test is a gentle traction on a small group of hairs (between 40-60 strands of hair) in several different areas on the scalp. A normal pull test will result in three or less extracted hairs in a single area. Six or more hairs that are pulled from one area would raise concern for the doctor or dermatologist to evaluate further. Other types of treatment consist of a more holistic approach to promoting hair regrowth like aromatherapies, herbal supplements, vitamins, and acupuncture—but have yet to be proven effective. Hair is an essential aspect of someone’s identity. For some women, their femininity, self-esteem, and personality are significantly linked to their hair—more so than men. Studies have shown that psychological problems are often developed after a woman is diagnosed with alopecia as she struggles to cope. One important factor to dealing with alopecia is accepting the diagnosis and recognizing the possibility of psychological issues that accompany the condition. Support groups and therapies are available to patients that can help a person learn to live with alopecia. Kallgren Dermatology understands the frustrating feeling that comes along with an alopecia diagnosis. Our team of dermatologists have extensive training for common skin problems and are readily prepared to diagnose and treat your alopecia. If you or a loved one are suffering from sudden patchy hair loss and pattern baldness, contact our Boulder dermatologist clinic to request a consultation and let us help you get the treatment you need.